"On a crowded bus at midday, Raymond Queneau observes one man accusing another of jostling him deliberately. When a seat is vacated, the first man appropriates it. Later, in another part of town, Queneau sees the man being advised by a friend to sew another button on his overcoat. 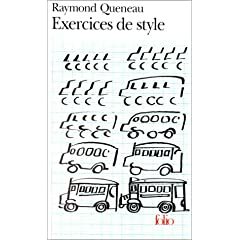 "Exercises in Style" retells this unexceptional tale ninety-nine times in ninety-nine different styles. An 'Abusive' chapter heartily deplores the events, 'Opera English' lends them grandeur. Raymond Queneau rendered Barbara Wright (the English translator) his 'heartiest congratulations', adding, 'I have always thought that nothing is untranslatable. Here is new proof'." While a great deal of foreign literature is translated, it often remains a niche interest, with very few people being aware of the authors and works in question. Raymind Queneau is one of these hidden gems, being in his lifetime a prolific poet and essayist as well as academic and author. He has not even risen to stardom significantly more following the publication of a graphical version of Exercices de style by Matt Madden four years ago. So how does such a successful French author remain so minor when his works are translated into English? Queneau relies heavily, in several of his works, upon wordplay, which may not always translate well or hold appeal for a wider audience. Others may not resonate well with the sense of humour of other countries, or run the risk of seeming so pretentious that they pass the regular reader by. Liking some of Queneau's novels perhaps relies on a love for the surreal or absurd, and none of these qualities build up a picture of an author whose works might be lovable in any sort of mainstream way. Certainly Exercices de style, one of his most well-known works, is best when taken in small doses. The repetitive nature of its construct means there is no narrative thread as such that needs to be followed each time the book is picked up. However, despite the repetitive nature of it, there is, perhaps surprisingly, always something new to find. Queneau is consistently innovative and imaginative throughout this novella, not only employing voices that will appeal to linguists (the past and present tenses, subjunctive mood, and passive voice appear to name but a few), but also those that appeal to a wider range of interests (such as the chapters centred on gastronomic, zoological, and medical themes). As a classicist I was especially tickled by the chapter on Hellenicisms. This keeps the central, very simple narrative interesting, lacing the story with surprising variety. The author's style is therefore something of the unexpected. It's unrealistic to expect any work of art to appeal to everyone, but there should be something in this to reach out to a good 90%. It's relatively short, and yet contains a great enough multitude of perspectives to keep readers returning. A great, accessible and slightly wacky introduction to the unconventional Queneau which will take any adventurous reader on a great journey. Thank you for your excellent review of Queneau's Exercises of half a year ago. You make it sound like a juke-box containing a hundred or so two-minute songs; play any song you like, they are all about puppy love anyway, but never more than a handful in one evening. And that's what it is, although many of the songs are more like minimal music. I'd like to draw your attention if I may to a project (how pompous it sounds) a few friends and me are doing: having read the Exercises, translated and untranslated, we decided to continue in the spirit of Queneau, and create at least another 99. By now you must have detected the foreign accent, and, yes, to be precise it's in Dutch. Possibly you understand Dutch, but even if you don't we thought it'd be nice to link up to your review and who knows, maybe you'd like to write the first original Exercise in English on our site? We'd be honored. I would love to; feel free to contact me at bianca[dot]dee[at]gmail[dot]com for further discussion. Looking forward to working with you!